MANCHESTER - November marked the 100th anniversary of the Gammons Hoaglund Company, a cutting tools manufacturer. Paul Stefanik, president of Gammons Hoaglund, said he will be sending thank you cards to its long term customers to celebrate the milestone. The company was founded in 1918 by William Booth Gammons, who also invented a tool called the helical taper pin reamer. The Gammons Hoaglund Company has changed its location various times. It has operated in various buildings in Manchester and in one building in East Hartford. The company started operating at its current Manchester building at 253 Broad St. 17 years ago. In the past, the manufacturer mainly made cutting tools for the mill industry. But as the mills moved out and more industrial companies came on board, the customer base of the company changed. 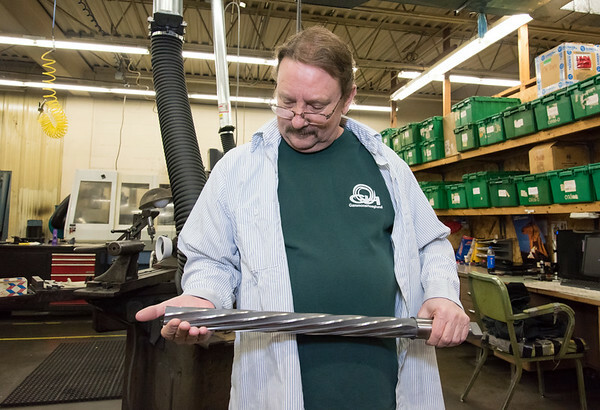 Gammons Hoaglund manufactures “extremely accurate” cutting tools also called reamers, Stefanik said. The business serves the automotive, aerospace, plastics and firearms industries. It also manufactures tools used in parts of musical instruments. Boeing Aircraft Company, Lockheed Martin, Caterpillar, Freightliner Trucks, General Motors, Ford and Beretta are among the largest customers that Gammons Hoaglund works with. The company has 20 employees. Stefanik said that after World War II, labor became more expensive, which forced manufacturers to become more efficient. “In the 1980s and 1990s computer controlled equipment came on board, so what happens when the computer runs is one person can run a lot more machines because he doesn’t have to stand there turning levers and things,” Stefanik said. “Now we are starting to have robots with automated loading and things like that. Production of things is bigger than it has ever been but the employment hasn’t” grown. In 2016, Gammons Hoaglund received $50,000 in funds from the Connecticut Manufacturing Innovation Fund Voucher Program (MVP) to purchase equipment. To reach some of the company’s efficiency goals, in 2017 the business purchased a collaborative robot. In addition, the company has partnered with local schools to provide internship programs. Stefanik said two out of three interns from Howell Cheney Technical High School are now employees at Gammons Hoaglund. The company also received state funding for the internship program in the effort to keep young people from leaving Connecticut. The state would pay Gammons Hoaglund half of an intern’s salary, up to $25,000 for a project, through the Technology Talent Bridge program. To learn more about the Gammons Hoaglund Company please call 860-432-0252 or visit the manufacturer’s website at www.gammons.com . Posted in New Britain Herald, Business, on Monday, 10 December 2018 16:24. Updated: Monday, 10 December 2018 16:26.